Predation is a natural everyday phenomenon that presumably has occurred throughout the history of life on earth. All the bird species now found in the UK suffer predation at some stage of their lives and most at every stage from egg to adult. Many different predators are involved including birds, mammals and reptiles but there is one predator that I find hard to consider dispassionately and that is Felis catus, the cat. Ian Newton, the eminent ornithologist and author, quotes some interesting research on the impact of cats on bird numbers in his excellent book "Bird Populations", Collins New Naturalist Library, Book 124, published in 2013. Here are a couple of examples. Woods, M., McDonald, R. A. & Harris, S. (2003) Predation of wildlife by cats in Great Britain. Mammal review 33, 174-88. This was based on a questionnaire survey in various cities covering the six month period April to August 1997. It showed that a total of 986 cats living in 618 households brought in 14,370 prey items of which 24% were birds with at least 44 species represented. In households that provided food for birds fewer birds were brought in but of a greater range of species. The number of items brought home declined with increasing age of the cat. On the basis of these figures, the total British cat population, then estimated at 8 million ( now 10.5 million) house cats and one million feral cats was calculated to "bring home" 27 million birds in this six month period. Churcher, P. B. & Lawton, J. H. (1987) Predation by domestic cats in an English village. J.Zool. Lond. 212, 439-55. This study in a more rural area looked at the items brought home by approximately seventy cats in the Bedfordshire village of Felmersham over a one year period. A total of 1092 prey items were recorded including 297 birds from twenty-two different species. Female cats on the edge of the village caught most. Older cats caught less than younger cats. It was estimated that at least 30% of the House Sparrow deaths in the village were due to cats. Ian Newton states that the impact of domestic cats on local birdlife clearly warrants more study. In the meantime our feline companions are supplementing the £900million spent on cat food every year with their own avian breakfast, lunch, dinner and supper. 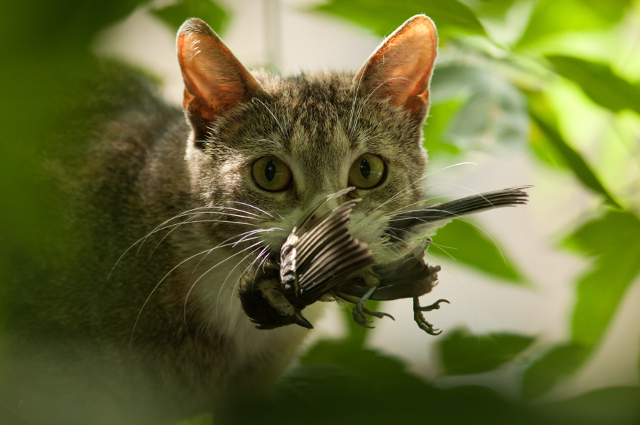 Tens of millions of birds are being killed each year by cats. 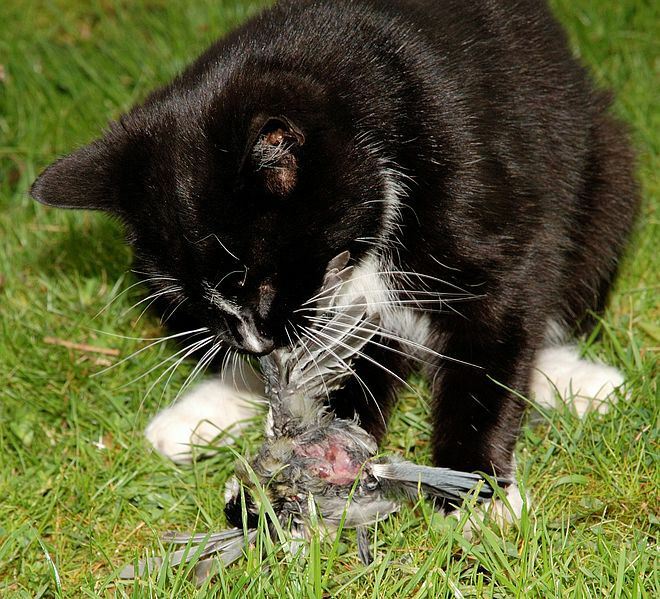 The RSPB has released advice for cat owners which they say could mean the difference between life and death for baby birds in your garden. This includes: fitting a bell to your cat's collar, making sure your cat is well fed and imposing a cat curfew around sunset, sunrise and after bad weather. This seems to me about trying to reduce anguish and distress on the part of the owner and little to do about conservation. Feral house cats, Felis catus, are often overlooked in discussions of invasive nuisance animals due to their ubiquity and our familiarity with them as companion animals. They are, however, among the most ecologically damaging introduced animals here on Arran and worldwide. Once there is that recognition, then perhaps there will be the necessary discussion to determine appropriate action.